If you have trouble cutting straight lines, this is the paper trimmer for you. 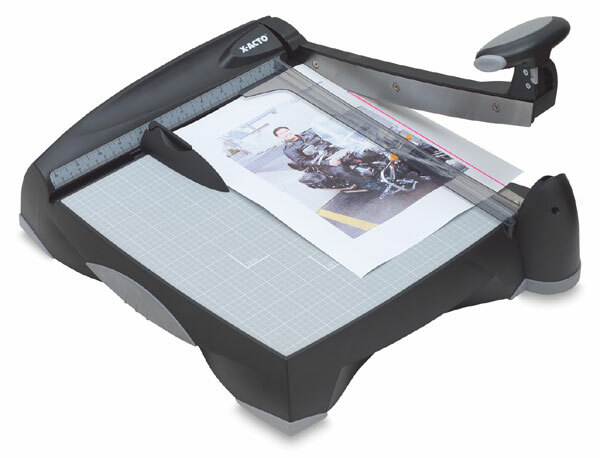 The X-Acto Laser 12" trimmer uses a laser-guided light to help you make a precise cut every time. Once the paper is in place, the X-Acto hardened steel blade cuts quickly and accurately and allows you to cut up to twelve 8½" × 11" sheets at once. An ergonomic handle makes cutting easy. The plastic model has a self-healing mat surface with easy-to-read grid lines. The X-Acto laser trimmer also includes a perpetual edge self-sharpening system and a deluxe safety guard. The unit is lightweight for portability, and the rubber feet help keep it in place while you work. A battery is included. Minor assembly is required. The unit measures 6¼" × 23" × 19½" (16 cm × 58 cm × 50 cm). ® X-Acto is a registered trademark.